The Childcare Act 2006 describes childcare as 'any form of care for a child including education or any other supervised activity'. 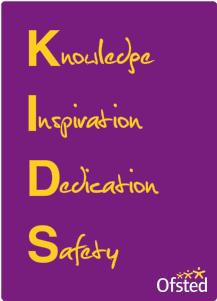 Registered with Ofsted, KKDC takes pride in being able to provide educational play where children have a free choice of what they do. The early years age group is from birth to the 31st August following their fifth birthday. The Early Years Foundation Stage is a framework designed for delivering high-quality care and education for children in the early years age groups where its focus is not on formal learning, but on learning through play. At KKDC, a child is encouraged to make choices and select their own area of interest (freely chosen self-directed play) and most activities are child-initiated and adult-led. We look at the length of time children spend in the area set aside for play when making judgements about children's achievements and whether they enjoy what they do. We also consider our parents and carers, as much as possible to make sure we receive their input and that their children's needs are met. Children learn in their own way, at their own pace and KKDC favours a play-based curriculum, allowing the child to lead and challenge their chosen activity. This approach encourages the child to question their own curiosities and obtain their own answers in a fun and interesting way. This approach holds tremendous significance if children are to continually learn throughout their lives. "Do not train a child to learn by force or harshness; but direct them to it by what amuses their minds, so that you may be better to discover with accuracy the peculiar bent of the genius of each"